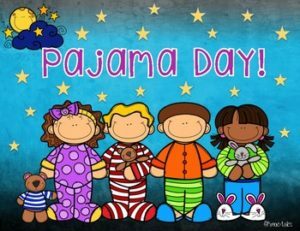 Students may join the holiday fun on Wednesday, December 19, 2018 by wearing their pajamas with a $2 donation. Pajamas should be school-appropriate – no shorts, nightgowns, or tank tops are allowed. Also, slippers, house shoes, bathrobes or pajamas that cover the feet(onesies) are not allowed.